With four facilities in Mankato and Waseca, 55-employee All American Foods last year blended 60 million pounds of ingredients for food manufacturers marketing national brands. Its founder and co-owner, Jeff Thom, is Connect Business Magazine Business Person of the Year 2008. The post-game television interview we all have witnessed: Famous football quarterback after tossing a key touchdown strike giving credit to his teammates for an emotional victory in The Big Game. Yet that made-for-TV, locker-room speech sometimes seems canned, even obligatory, as if spreading the love around had more to do with the player maintaining an image than a true appreciation of his teammates’ contributions. With genuineness pressing around every syllable, Jeff Thom, founder and co-owner of $20 million-plus and 55-employee All American Foods, gave due credit in this Business Person of the Year 2008 interview to a number of people for his success. In general, the printed word fails to capture the emotional subtleties of face-to-face, mitwelt communication, such as the grinding teeth, flushed cheeks, wringing hands, and glistening eyes. Words on paper have a different feel than words heard in person. This writer has interviewed hundreds of business owners and knows well the obligatory “television interview drill”—we all do it and are genuine in varying degrees—yet with Thom the credit offered to others didn’t seem even remotely obligatory. His words had that unmistakable ring of authenticity, and at times an emotional crack or two, revealing more about his character than printed words could ever portray. Thom attributed his success to a blend of people, including the Davises of Davisco Foods International, Dennis Anderson, his mother and wife, the Friend Who Shall Remain Nameless, and All American Foods co-owners, directors, and employees. Rather than spreading obligatory love like a big-headed football quarterback, Jeff Thom seems to understand far more than most that his business success wouldn’t have been—and won’t be—possible without the game day contributions of the special players around him. In a letter you wrote to customers and employees celebrating 20 years of business, you acknowledged your wife Cindy and sons Joseph and Andrew. You also acknowledged your mother. Normally, a businessperson wouldn’t acknowledge his mother in that way. What is there about your mother you admire? She raised us primarily by herself. She taught me the value of personal responsibility and hard work, by her example. She was always working, and working, and working, to make things better for her children. She worked full-time as a healthcare aide in St. Peter, along with being a restaurant hostess, cleaning lady, etc. We weren’t given fish; we were taught how to fish. That was an important lesson that my wife Cindy and I have taught our children as well. Mom worked full-time on the night shift yet she was there when we got up for school, there to cook and feed us dinner, there to make a clean home, there to put us to bed. Then she went to work and I am not quite sure when she slept. She has always been a “caretaker,” and still is at age 71. Did you have brothers and sisters and where did you grow up? One older brother, an older sister, and a younger sister. In Cleveland, Minn., we first rented and lived on a farm and then moved to town and rented a house across the street from our landlord. After graduating from high school, I moved from Cleveland to an apartment in St. Peter to continue working for St. Peter Creamery. I am pretty hard on myself. To prove that point, I have way too many weaknesses to mention here. I think being hard on myself is more of a defense mechanism than anything. As for strengths, I really know what I want and can be very determined. I’m very good at planning from both a personal and business standpoint. I’d also like to tell you that I’m good at picking people to work with but, like everything else, I think I’ve been more lucky than good. Can you give an example of being good at planning? From a business standpoint, our campus and company’s financial position have all been pretty planned out. We’ve never acquired a business or built a building until paying for the last one. From a fiscal standpoint, I’m extremely conservative. I started this business as far in the hole financially as a person could be. Partly as a result of planning, we’ve never had to lay off anyone and as long as I own this business, I don’t plan to. It is my job and the job of our management team to make sure we don’t because our employees have families that depend on a job, just like I do. And some of your employees may struggle like your mother did. We all struggle at times, in different ways. Sure, my mother struggled back then but she made choices. No matter how much she earned, we always had everything we needed. We didn’t always have the fanciest new things, but we had what was important. I think I’m good at remembering where I came from and I always will. What sticks out in your memory about growing up that makes you who you are today? When my folks split up, I was in the second grade. We moved from a farm up north to southern Minnesota, where my mother could be close to her sister and mother. I remember my mother being ashamed of getting some government assistance but we had no choice. We were on medical assistance and food stamps for a short time. Back then, I remember hearing about a woman who had driven to the courthouse in a nice Cadillac for her welfare fraud trial and here was my mother working her rear end off so she didn’t have to ask for help. It was good for me to experience Mom’s effort. I remember how proud she was when we didn’t need assistance of any kind, and I was too. Another time as a kid I found a five-dollar bill. I used it to buy my sisters and I some frozen cream pies at the grocery store. After we polished them off, I remember feeling guilty about spending the five dollars on something that had no lasting value. What had I done with that five-dollar bill? Your mom probably was earning only five dollars per hour. I’m not sure if she earned that much, at the time. My children learned to be earners before they were consumers, just like I did. I didn’t get a credit card in the mail like college kids do now, and I am glad I didn’t. My sons have heard a speech of mine over and over. They know, when my sentence starts out with “Money is a tool,” exactly what is coming. Money is a tool. It’s just like a hammer. You can smack your thumb with it, or you can use it for good. When did you start working for St. Peter Creamery? In 1979, the summer after my junior year in high school. Before that I had been bagging groceries at a local grocery store. I thought that if I could get a job at St. Peter Creamery and work hard that summer, maybe I could get in on the night shift when my senior year started. That’s what happened. When I started my senior year that fall, I worked midnight to eight. What did you admire about the Davises, owners of St. Peter Creamery? I worked for Stan Davis when Dennis Anderson was general manager at St. Peter Creamery. They gave me great opportunities. I was there eight years (during which I attended MSU for a short while) and there wasn’t anything I didn’t get to do in that plant. The last few years I was in the office and became involved in sales, customer service, and purchasing. It was a large part of my business education, absolutely. Stan and Mark Davis and Dennis were definitely my teachers, from a business standpoint. I can’t express enough how grateful I am to them. I had been selling commodities and doing customer service for St. Peter Creamery. Occasionally customers would call, and say, “Jeff, can you blend three of those ingredients for us and put them in a 50-pound bag?” We didn’t have the dry blending capacity, and it wasn’t a future goal either. During my last year and a half of employment with them, I had to say no several times to those opportunities. In 1986, I decided to leave the company after learning my job would be relocated to South Dakota. I was single at the time and thought I should be able to take care of myself financially. I would custom blend ingredients for the customers that we chose not to serve at St. Peter Creamery. So I gave a six-month notice, and received phenomenal support from Stan, Mark, and Dennis. I worked with them those six months and helped them move their office to South Dakota. And they helped me in many ways getting started with All American Foods. Just one of the things Mark did was he bought me a ticket to a seminar he thought would be helpful regarding ratio analysis. He thought it was important information that I should learn and he was right. To this day, I give our ratio analysis information to the banks we deal with. They don’t need to ask me for it. I was so blessed to have help from Stan, Mark and Dennis. To be honest, there isn’t much I wouldn’t do for any of them. I owe them a lot. You wouldn’t be where you’re at today if it hadn’t been for them. Without a doubt, they were a big part of getting All American Foods started. One of our first customers, here at All American, helped me as well. He was one of those customers that I had to say no to several times regarding his blending needs. One day he came to town and asked how I was doing with my finances, with regards to starting my new company. I told him I was short on working capital so he wrote me a check for $20,000 and said I could pay it back when I could. I was so humbled. I gave him my word that I wouldn’t tell others his name. We had known each other only about four years but he was confident in my ability. I asked him why he was doing this and he said, “You’re not going to understand this until you get to be my age. (He was in his 60s.) But when you are, you will ask yourself, What’s this world all about if you can’t help people?” I swore after that there was no way I’d have to wait until I was that age to realize that. He passed away about ten years ago and was a good old-school handshake man just like Stan and Mark Davis have always been. Back when I was 16, just starting at St. Peter Creamery, this older guy—that’s what I thought then—came in and talked to me on the production line. Back then we were filling a bag about every 60 seconds. This guy asked, “How’s it going?” He asked other questions, too. “You’re new here, aren’t you?” “How do you like working here?” I told him that so far I liked my job and was glad to have one. He said, “Have a good day” and he left. I asked one of the managers, “Who was that guy?” He said it was Stan Davis, the owner. He cared enough to ask. He was, and still is, genuine and down-to-earth. All of the people who helped me get this business going are genuine just like that and I am so grateful. In the late 1980s, you participated in Enterprise Zone Credits and TIF in Mankato to build a new building. I started All American Foods in 1987 with an SBA loan. At that time, we had leased one of the old Kayot buildings. Getting the SBA loan when I started All American Foods was a lot of work. I borrowed everything I could to get All American started. I had some rental property I borrowed against. I sold my life insurance policies. I went to I don’t know how many banks, and was told over and over how many new businesses fail within the first five years. I’m telling you, that just made me more determined. Two years later I used Enterprise Zone Credits and TIF to build our first plant. Our TIF projects paid themselves back to the taxpayers very quickly and, in my opinion, TIF projects all should. When deciding to construct our first plant, we primarily looked at Mankato and St. Peter. In 1989, we were already in Mankato, so they had a leg up. Mankato also had Enterprise Zone Credits and better access to highway 14. St. Peter is a great city. I still have a lot of employees and business relationships there but Mankato turned out to be All American’s corporate home. How large is All American Foods? In our three Mankato facilities and one in Waseca, we have about 55 employees. We don’t normally disclose sales, but we do process and package over 60 million pounds annually. We serve approximately 100 customers in over 150 different locations around the country. Can you give a range of sales? Our sales exceed $20 million but we don’t focus a lot on sales dollars. They fluctuate with commodity prices so our sales dollars can take big swings from year to year. I measure our business on volume because that is a better measurement for us. Years ago, I had a conversation with Lowell Andreas, former president of Archer Daniels Midland. He said he wasn’t concerned at all about dollar sales. All he was concerned about was net profit. We combine different food ingredients so customers can buy those combinations in a bulk unit in 30 to 2,500 pound bags. A bag could have two to 15 different ingredients. You won’t see our name though on a well-known candy bar, ice cream carton, salad dressing bottle, frozen entree box, cheese product, etc., but the ingredients we have mixed, are inside of a lot of them. Can you name the ingredients you mix? Any kind of dry milk product, such as nonfat milk, buttermilk, or whey products; milk proteins; soy flours, soy isolates and concentrates; maltodextrins; corn sugar; regular sugar; wheat flour. We mostly buy these products from Midwestern suppliers, such as Davisco Foods, CHS, Land O’Lakes, Cargill, First District, and AMPI. Those are the major ingredients we use in our Pro Mix® line but we also procure some liquid ingredients and have those processed for us as well, prior to our usage. Our products are sold to food manufacturers all over the country. The majority of our Pro Mix® dairy blends are sold east of Denver, but we sell our non-dairy blends nationwide. Our products end up on grocery shelves all over the country, in major branded retail products. Why can’t you name some of the companies? We have non-disclosure agreements, especially with our larger customers, which own name brands and are companies you would instantly recognize. The largest part of our business is our Pro Mix® product line, which accounts for 70 percent of our business. The other 30 percent is custom service work, in which customers have us process and package to their specifications. Those are confidential customers too, because those formulas are often theirs. Twenty years ago custom processing and packaging was all we did and it is still an important part of our business. What goes on at your Third Avenue technical center? Our technical services personnel help us develop our latest Pro Mix® products at that facility. Directions for their use are also developed and this helps our salespeople market them. At that facility we literally make the pancake, or the caramel, or the salad dressing, using our products. You have acquired two companies over the years, Waseca Foods and Forester Foods. What did each of those add? I’d known the owner of Waseca Foods for years. They primarily performed custom service work, like we did when we started. They had some unique blending equipment that allowed us to expand our product line with more value added products. They also had a great group of people and facilities. That acquisition has proven to be a valuable part of All American Foods. The acquisition of Forester Foods allowed us to expand our Pro Mix® line. They had a more complete line of products that were used in frozen dessert and eggnog applications and we incorporated those into our line. Once we made the decision to expand in that market, we looked at a couple of acquisition opportunities and Forester Foods ended up offering us the best value. That new business and volume has all now been incorporated into our Mankato and Waseca facilities and we continue to grow our presence in that market as well. On your website, you have a mission statement and a code of ethics. In your mission statement you have the word “integrity,” which is a word you seldom hear these days. What does integrity mean to you? We’re very open in the way we do business and the way we quote our current and potential customers. Very rarely are we the cheapest but we are usually the ones that provide the best value, when comparing apples to apples. Companies looking to buy food ingredients are looking for the best cost-per-pound of desired performance. Sometimes people selling food ingredients aren’t as open as we are. That openness, or transparency, benefits all we do and we wouldn’t have our reputation without it. I’ve been in a number of businesses over the last eleven years as editor of Connect Business Magazine and it’s rare seeing a business with a code of ethics. Why develop that? Several years ago one of our bag suppliers had this as part of their corporate report. I thought the idea made sense and our employees, customers and potential customers should be able to find out who we are and what we believe, with regards to our business practices. With that in mind, we developed our own code of ethics. Our customers and employees are our two biggest assets, absolutely, without a doubt. You can’t take care of a customer without a great employee. You can’t take care of an employee without a great customer. We have both. All the buildings, land, equipment, product lines, our reputation—none of it would be possible without great employees and customers. You recently hired Rod Mitchell, long-time Mankato businessman, and most recently a Midwest Wireless executive. Why? For the same reason we hired Keith Brekke, Tom Roessler, our directors and everyone else we employ. Over the years, I have realized more and more the value of new knowledge. A Director of Market Development was one of the last director positions that Keith, Tom and I felt we needed to add. We had all other areas of the business covered so this was a logical move. Rod has been in business many years. He knows you have to bring in more money than you spend and he knows how to measure a good future business opportunity. Right now we consider ourselves an industrial ingredient supplier. There are many potential areas for us to look at that we should be exploring and that is now his job. We needed to explore opportunities to develop more complete mixes for institutional and food service applications. Other potential growth areas include nutraceutical and health food products along with the pharmaceutical industry that we could potentially offer our products and/or services to. We wanted to explore those potential opportunities and now, with Rod’s help, we are. Keith, Tom and I own All American Foods. We work together on strategic planning issues such as this. I do my best to stay out of Keith and Tom’s way and frankly the directors’ way as well. Not that I don’t become involved, but most of what I do is project related, whether working with new products, customers, processes and packaging capabilities, or along with acquisition opportunities. That is what I love to do and we all become good at the things we enjoy. I enjoy figuring out how to put things together. Keith is good at managing the business and Tom is good at managing procurement and operational logistics so we compliment each other very well. I am fortunate to work with both of them and all of our directors as well. There was a time when Keith and Tom became part owners. What was your reasoning that brought their ownership about? I’ve seen bringing in partners work in some businesses and fail in others. Keith and Tom became owners about five years ago. Frankly, I hope to expand ownership in the future. It was done because they deserve it and it only made sense because they are responsible for helping make all major decisions here at All American. It keeps them at All American Foods? Sure. It helps to keep good people. In my opinion, we are employee-owned. We always will be if I have my way. How many employees or how few become owners—I don’t know what the future holds. But as far as I’m concerned we are employee-owned. I want people that work here to make the major decisions. That way we are living in what we create and I think that is important. If you had to do everything over, what would you do differently? We probably haven’t grown as fast as someone more aggressive might have done. The missed opportunities would probably be, from my perspective, that I didn’t hire new knowledge quickly enough. I was more worried about cash flow and didn’t realize how fast new knowledge can pay for itself. Also, I’m sure there were times when I probably should have borrowed more to grow quicker. I just wasn’t comfortable doing so at the time, but I also wanted to make sure we had controlled growth as well. When did you hire Tom and Keith? Tom, a former Land O’ Lakes and St. Peter Creamery employee, has been here since 1990. 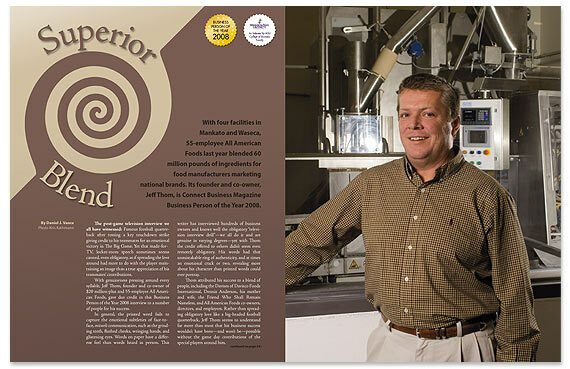 His past experiences in dairy processing and packaging have been extremely valuable to us. Keith has been here since 1997, first as general manager and now as our president. Before hiring Keith, I was getting burned out. I was doing jobs I didn’t like so obviously I wasn’t doing a very good job at it either. It wasn’t in the best interest of any of us. Then another company made me an offer to buy All American Foods. I didn’t want to sell. After some soul searching, I decided to hire someone who was good at doing those different functions that I didn’t particularly enjoy and frankly wasn’t good at. Out of this I ended up hiring Keith Brekke, a former employee of both Hubbard and Sween. His past successes were impressive and his experiences have been invaluable to all of us. When he came, he said he’d only probably work four or five years and I am sure glad he has stayed on longer. A few years back, Keith, Tom and I would go to each of our cabins just to mow lawns and maintain them. Now we actually get to enjoy them as well. Keith is coming home today from a little vacation and Tom leaves next week. We’re all starting to enjoy life a little more while we are still learning from each other and growing this company. I’m not a big title guy. I’ve always said that a person’s real title is what other people call them. Keith and Tom certainly have the titles they deserve. I feel so blessed to work with all our employees because as far as I am concerned, they are the ones responsible for the success of All American Foods. They all have a tremendous amount of respect, not only from me but from our industry as well, because they have earned it. Once again, Connect Business Magazine promoted its Business Person of the Year competition in its July and September issues. We attracted a sterling pool of nominees, perhaps the best ever. In early October, a team of eight Minnesota State University business professors chose Jeff Thom of All American Foods as Connect Business Magazine “Business Person of the Year 2008” based on the following criteria: business results, leadership abilities, community involvement, and character. Clint Brown of ICS in St. James, and Wayne Kahler of Kahler Automation in Fairmont, were runners-up. Born: October 23, 1962, in Hastings, Minnesota. Education: Cleveland (Minn.) High School, class of 1980. Attended MSU, Mankato. Board and organizational involvement: ISJ-Mayo Hospital, Elks Club, and South Central College.